It’s maybe one of the first things I learned how to make when I became kind of a grown-up — it’s so easy, it should be in everybody’s back pocket. 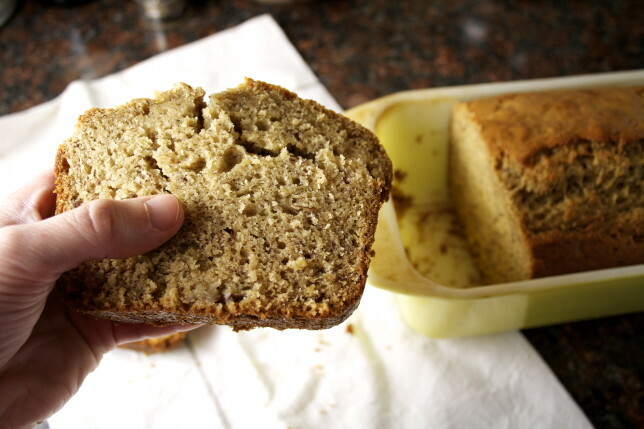 I remember the winter of my sophomore year of college, my mom sent me a care package: a box Earl Grey tea and a loaf of her homemade banana bread. No doubt, it might have been the one combination that helped me get through finals hell while I was on the verge of a terrible, horrible, no good, very bad cold. It held off the collapse that would come when I finished the last final and returned home for four weeks of relaxation. It was sweet medicine, TLC away from home. My mom’s banana bread is so tender, it almost becomes custardy after it cools. And that’s still generally what I look for in a good, basic banana bread. I don’t want “bread.” I want a crumb that I don’t have to chew, crumb that just melts in my mouth. I want bananas — in the shape of a loaf. 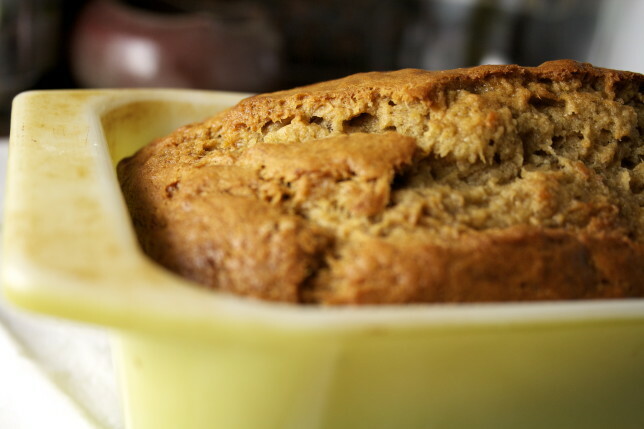 Here, it’s kicked up a notch with browned butter, giving it a bit of nuttiness without the distracting presence of walnuts or pecans (which are, in my opinion, only acceptable in banana muffins — leave the bread alone!). Brown sugar replaces some of the usual white sugar, helping to give it a deeper, earthy sweetness. And just the tiniest bit of cinnamon highlights the bananas. Oh, and it’s kind of healthy, too, made with half white whole wheat flour. You know, to make you feel less guilty for eating fruit in what is, essentially, cake form. Because — well, you don’t need a reason. I mean, it’s banana bread. Haven’t baked with white whole wheat flour before? Try it here. It’s milled from white wheat rather than red, which is what whole wheat flour usually is, and is milder, coming closer to all-purpose. 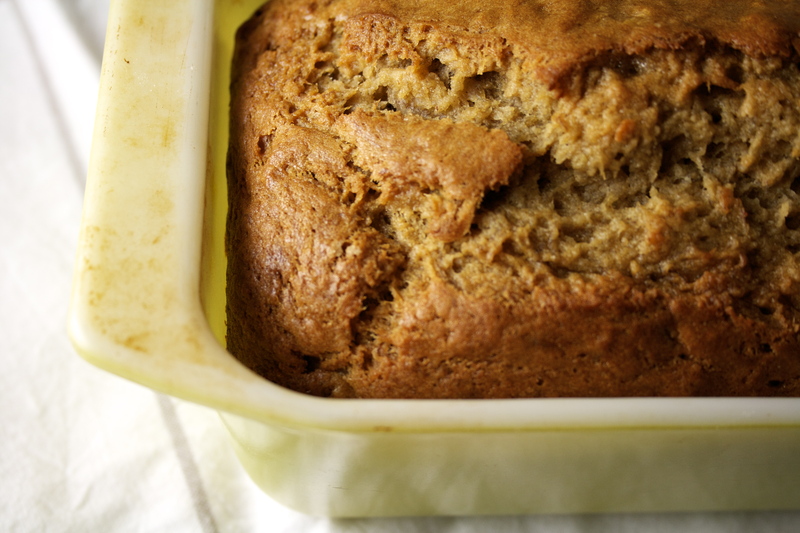 But you can still use regular whole wheat, or, of course, 100% all-purpose flour. And yes, you can add nuts. I guess. Add up to ½ a cup. The same amount of chocolate chips would be absolutely delicious. 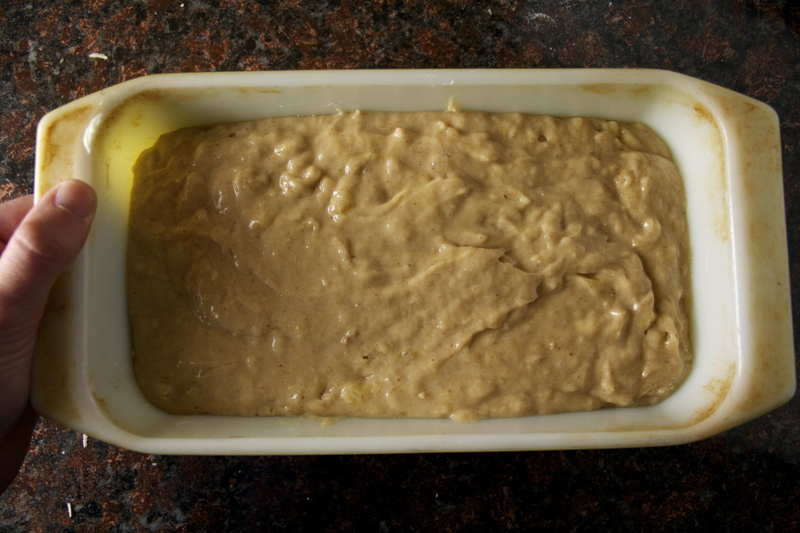 Preheat oven to 350 degrees, and grease a 4 ½ x 8 ½-inch loaf pan. Melt the butter in a medium saucepan or skillet over medium heat and continue to cook, swirling the pan until the butter is a dark golden brown. Transfer to a small bowl and set aside to cool slightly. 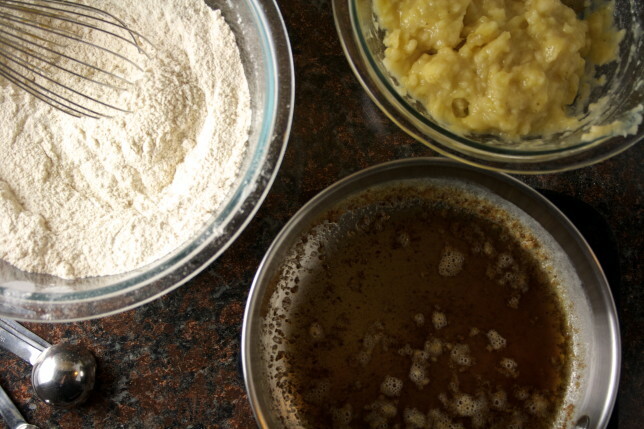 In a large bowl, whisk the flours, cinnamon, sugars, baking soda, and salt. Set aside. In a medium bowl, whisk together the mashed bananas, eggs, sour cream, vanilla, and butter (I like to add the butter last to give it even more time to cool). Gently fold into the flour mixture with a rubber spatula until just combined, taking care not to over-mix. Pour into prepared loaf pan, spread the top so that it’s even, and cook for 55-65 minutes, or until a toothpick inserted into the center comes out clean. I like to check at the 55-minute mark and then tent it with foil to prevent the top from over-browning. My banana bread almost always needs the full 65 minutes. Yum! 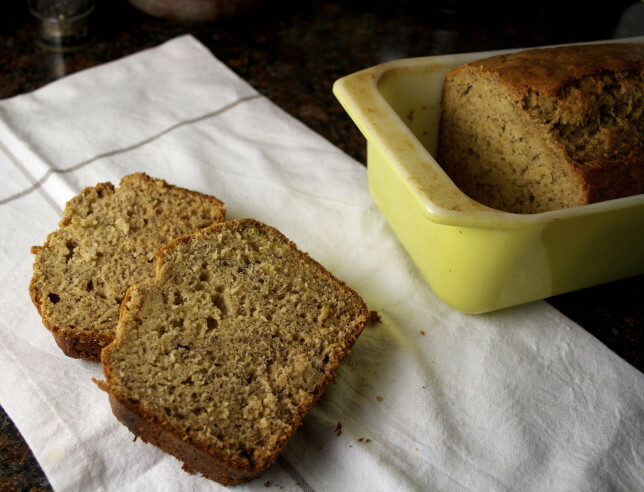 I recently tried my own version of banana bread with brown butter and cinnamon! Sooo yummy. Yours looks delish! Thanks for this great recipe. I am trying to be creative with cake dishes and love recipes like this.